On 20th February 2004 an auction of 10 Buddy Bear exhibits in aid of UNICEF was held at the "Hotel Zur Tenne" in Kitzbuehel. 9 original Buddy Bears were auctioned off together with a 10th exhibit - an original chainsaw-sculpture by the well-known sculptor Roman Strobl from Going near Kitzbuehel. In a cheerful and relaxed atmosphere a real bidders’ battle took place. The winner of the evening was the "United Buddy Bear" designed by the artist Nancy Torres on behalf of Cuba. It was auctioned off for € 12,000. Another event that stood out during the evening was the auction of the original wooden sculpture that the artist Roman Strobl from Going near Kitzbuehel had created from a tree-trunk with his chainsaw for the opening of the circle of "United Buddy Bears". 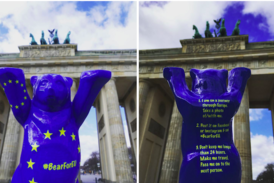 The sculptor Roman Strobl together with his wife, Anne Strobl, has also designed the first original Buddy Bear. This made it easy for him to saw this original sculpture from a tree-trunk. This unique work of art was auctioned off for € 7,000. Total proceeds of € 44,900 were achieved in aid of UNICEF during that evening. UNICEF Austria used this money to help victims of the Iran earthquake. And there was more reason to celebrate that evening - the € 500,000 threshold in donations for UNICEF and other organisations helping children in need was exceeded. Dr. Gudrun Berger (General Secretariat Austrian Committee): "I would like to express with grateful thanks how happy I am that the "United Buddy Bears" in Kitzbühel are again in the service of UNICEF. I am particularly happy about your decision to donate the proceeds from the auction of the Buddy Bears to the children in Iran to help them find a way into a new life after the earthquake catastrophe. Thus the "United Buddy Bears" are again building a strong bridge of mutual responsibility and cooperation between all cultures and continents."